A lot of great and well-known people have said through and through that if you want to earn real money, you should enter the real estate business. 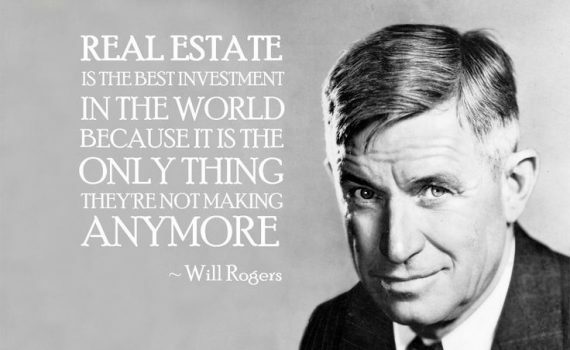 People like Armstrong Williams, Will Rogers, Andrew Carnegie and more have shed some inspiring light on the benefits of owning and letting properties. We at Clearhaven Lettings couldn’t agree more! This article was written to inspire those landlords, and those who are looking to get into real estate. Sure, it is a tough business to be in with all the competitors, but in the end, if you work hard enough for it, the prize will be worth it. Here’s an article from Christopher Middleton on how you can get rich quick as a landlord. The first fact you have to face, when you start letting out property to tenants, is that no one loves a landlord. Look throughout literature, and what seems to run through the veins of the person who charges you money to live in their property is not the milk of human kindness, but a cocktail of meanness and miserliness. Think of Rigsby, the character played by Leonard Rossiter in the television sitcom Rising Damp. Beneath his grubby cardigan beat a heart that – Miss Jones aside – only money made beat faster. But with a third of retirement savers now considering investing in buy-to-let properties, thanks to the recent pension changes, a lot more people are about to become landlords, almost by accident. The first rule of renting-out, therefore, is that you can’t do it all yourself. It’s not just a matter of knocking on the door on the first day of every month and collecting the rent; it’s a matter of having all your gas and electricity installations checked for safety, as well as keeping your insurance up to date. There is, of course, far more to a successful rental portfolio than just choosing places within walking distance of a station. The one thing that all successful landlords will tell you is that renting out property isn’t just a hobby, it’s a job.